This book addresses the possibilities of analyzing the modern international through the thought of Michel Foucault. The broad range of authors brought together in this volume question four of the most self-evident characteristics of our contemporary world-‘international’, ‘neoliberal’, ‘biopolitical’ and ‘global’- and thus fill significant gaps in both international and Foucault studies. 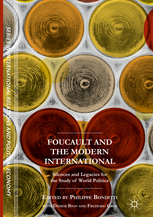 The chapters discuss what a Foucauldian perspective does or does not offer for understanding international phenomena while also questioning many appropriations of Foucault’s work. This transdisciplinary volume will serve as a reference for both scholars and students of international relations, international political sociology, international political economy, political theory/philosophy and critical theory more generally. Philippe Bonditti holds a doctorate in Political Science from Sciences Po Paris, France, and is currently Lecturer at the European School of Political and Social Science (ESPOL-UCL), France. Previously, he was Assistant Professor at the Institute of International Relations of the Pontificial Universidade Catholica in Rio de Janeiro (IRI/PUC-Rio), Brazil, and Postdoctoral Fellow at the Watson Institute, Brown University, US. His research interests focus on contemporary discourses on violence, war, and security, the transformations of the modern state and the art of government, (critical) International Relations theory, (critical) security studies, contemporary French philosophy, and political theory. Didier Bigo is Associate Professor (tenure) at Sciences-Po, France and Professor of International Relations at Kings College London, UK. Bigo is Editor-in-Chief of the French quarterly journal Cultures & Conflits and launched, with R. B. J. Walker, the journal International Political Sociology. His research interests include security and liberty, biometrics identifiers and databases, antiterrorist policies in Europe after 9/11, the merging of internal security and external security, migrants and refugees in Europe, critical security studies, and international political sociology. Frédéric Gros is Professor of Philosophy at Sciences Po Paris, France. His research focuses on contemporary French philosophy—in particular the thought of Michel Foucault, whose writings, such as Subjectivity and Truth, he has edited—the foundations of the right to punish, issues of war and security, and the ethics of the political subject.